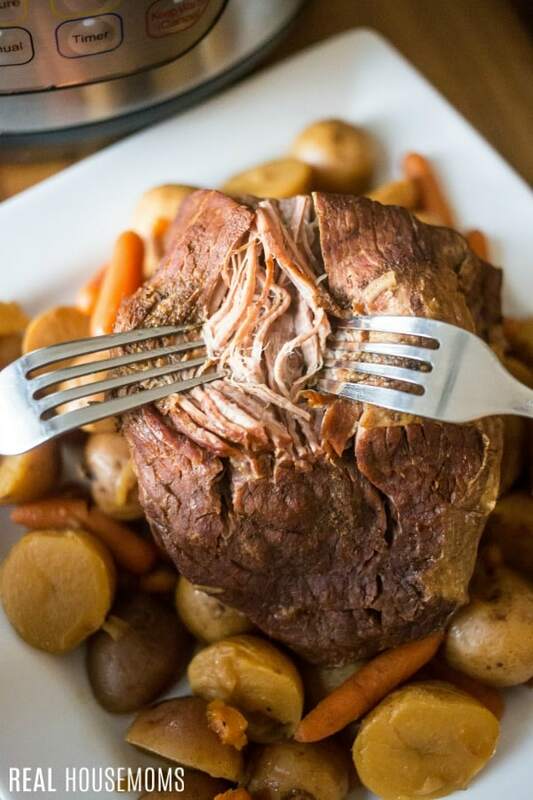 Pressure Cooker Pot Roast is an easy weeknight meal that comes together in just minutes! Whether your a pressure cooker pro or just getting started, this pot roast recipe is fool-proof! 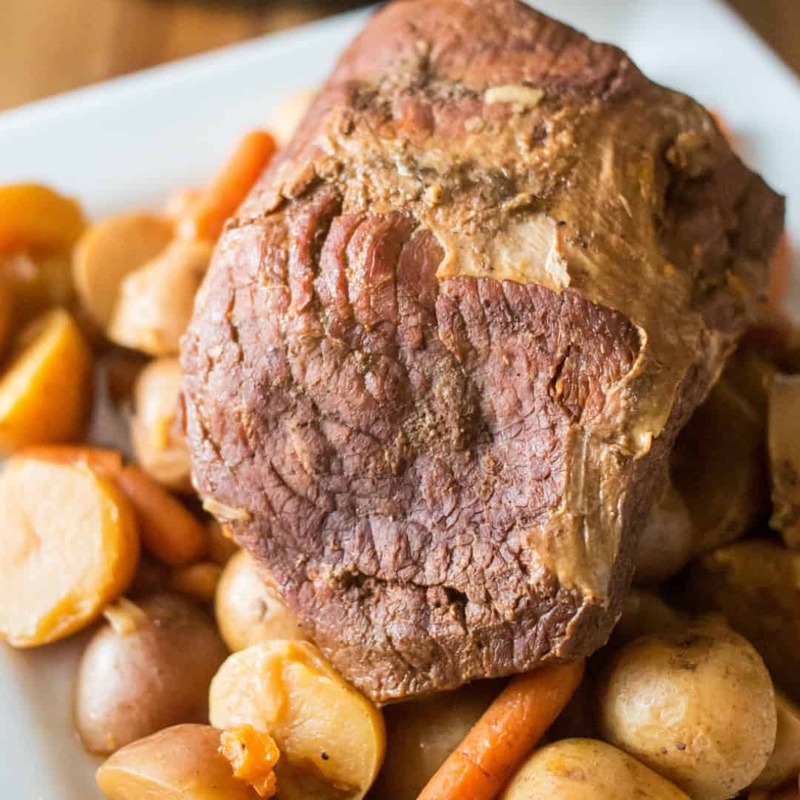 Break out your pressure cooker for this one, because this Pressure Cooker Pot Roast with a basic beef roast, potatoes and carrots is going to be on your list of quick and easy Instant Pot meals you can whip up in just minutes. 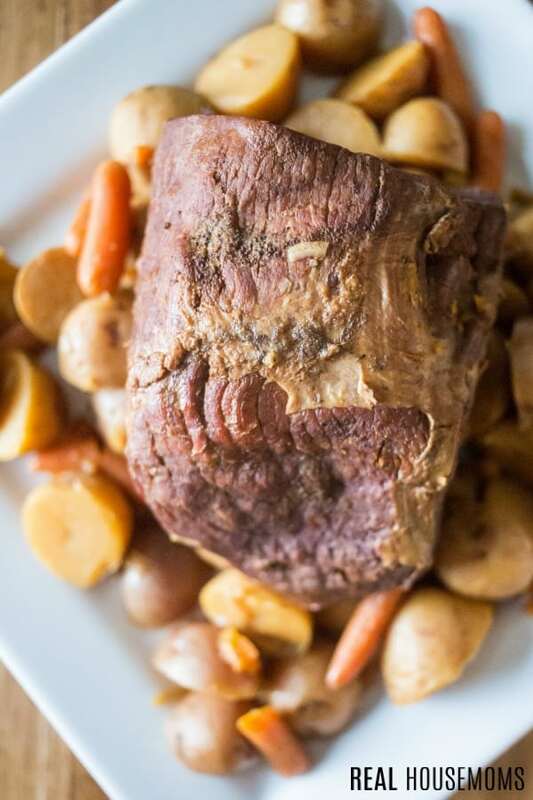 This easy pressure cooker pot roast recipe has all the classic flavors of a Dutch Oven Pot Roast you crave and takes a fraction of the time you’d spend roasting in the oven. Pot roast in a pressure cooker also comes out crazy moist, which is usually a challenge with this recipe. Like this recipe? Pin it to your PRESSURE COOKER pinboard! 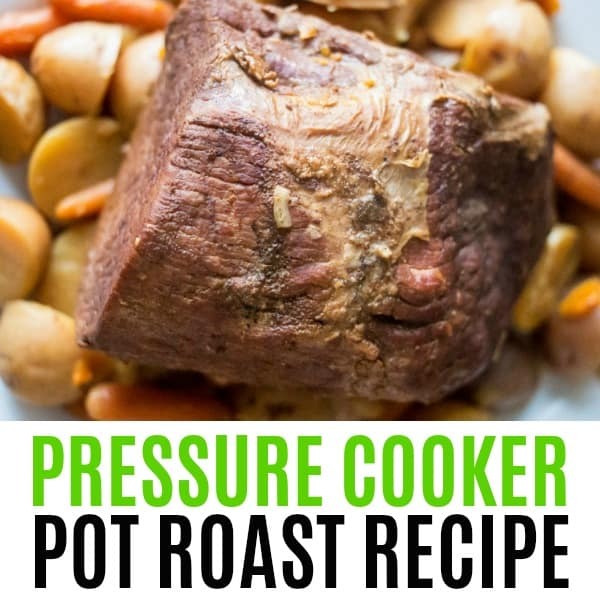 I love easy pressure cooker meals! I jumped on the bandwagon during the holidays last year and purchased an Instant Pot and I haven’t looked back. It’s a little tricky when you first get started but if you have one and haven’t used it yet or are thinking of buying one, I have to say that it’s one appliance that is a must-have in our home. Don’t be nervous, these pressure cooker recipes will come in handy! I have always been a fan of making a Sunday Pot Roast. I think because I grew up where my mom would put on a roast before church on Sundays and we’d always have a great meal come dinner time. Meals with memories are some of the best, right? While this pressure cooker pot roast has an updated cooking method, it’s just as comforting and delicious as the traditional Sunday supper. Season and sear roast in the pressure cooker. Once browned, remove to a plate. Create broth for cooking, and add roast, potatoes, and carrots into the pressure cooker. Cover and cook on high. Allow pressure to release naturally, before venting any remaining pressure. Remove roast and veggies from pot and serve family style. I love how easy roasts come together in the Instant Pot so you can have that slow-cooked taste with a little prep and less cooking time. This is truly a one pot meal that’ll have everyone asking for seconds. Easy pressure cooker meals full of flavor are always a hit at my house, like our Instant Pot Jambalaya – but be sure to check out all of my Instant Pot recipes for more inspiration. Want more pressure cooker recipes? Instant Pot: This all-in-one cooker is the best thing I’ve put on my countertop! It’s a pressure cooker, slow cooker, makes rice in minutes, and more! Ladle: If you’re a soup lover, you need this ladle in your life! Set your pressure cooker to saute and add 2 tablespoons of butter. Once pressure cooker is hot and butter is melted, season your roast with garlic salt and pepper and place into the pot and sear roast on both sides. Once the roast is seared on both sides, remove from pot and set aside. Keeping the pressure cooker on saute, add one cup of water and 1 teaspoon of Better Than Bouillon Beef Base, stir until combined and scrape up any brown bits from searing the roast. Now turn the pressure cooker off of saute, add the roast back to the pot along with your chopped little potatoes and baby carrots and top with your onion soup mix. Add lid to pressure cooker, close lid, move pressure valve to sealing, and set to Manual or High Pressure for 90 minutes. Once the 90 minutes is up, let pressure cooker natural release for 10 minutes then set valve to venting to release the rest of the pressure. Interesting, we didn’t encounter that but thank you for the feedback! Followed the recipe to a T and it came out perfect! Thank you for sharing!